Swine Flu and CAFOs – Any Connection? Swine flu is certainly getting people’s attention, and raising a lot of discussion about factory farming and its possible impacts on our health, as well as the environment. We’ve just published a few satellite views of Concentrated Animal Feeding Operations (CAFOs) near La Gloria, the town in the state of Veracruz, Mexico, where the first case of swine flu associated with the April, 2009 outbreak was identified. Large hog-farming operations near town have been implicated by local residents as a possible cause, but as of now (4/30/09) no evidence has emerged to support any such link. 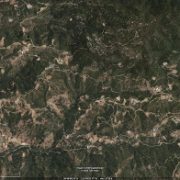 These pictures were derived from Google satellite images taken in 2003 and 2006. 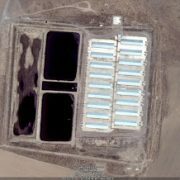 We’re not sure if these facilities are hog farms; chicken farms look similar, although in the U.S. chicken farms typically don’t have such large open waste lagoons. Write a comment to let us know what you think (and why). 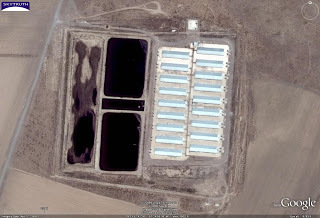 On-the-ground photos of a hog farm near La gloria, clearly showing the metal sheds and large waste lagoons, are here and here. 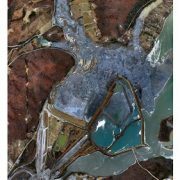 And to see closeup air photos of hog farming facilities in Canada for comparison to these Google satellite images, peruse this gallery. The incredible volumes of manure produced at CAFOs that raise cattle, hogs and chickens pose a threat to water quality wherever the manure is improperly stored or over-applied as fertilizer. To learn more about CAFOs, check in with the folks at Waterkeeper Alliance and browse this report from NRDC; and look over these possible solutions to the hog-waste problem proposed by Environmental Defense Fund. https://skytruth.org/wp-content/uploads/2009/04/SkyTruth-LaGloria-CAFOs-17apr06-GE-detail.jpg 218 320 John Amos /wp-content/uploads/2016/08/test_logo.png John Amos2009-04-30 18:27:002019-03-05 11:41:14Swine Flu and CAFOs - Any Connection? Everything we do has an impact, and utility-scale renewable energy development is no exception. Wind farms, solar power facilities, and geothermal energy developments share some of the same characteristics that make up the visible “footprint” of oil and gas drilling: access roads, utility corridors, equipment staging/storage. Of course, these renewable energy projects are a lot lighter in impacts that we can’t see so easily, like air and water pollution and contribution to global warming. 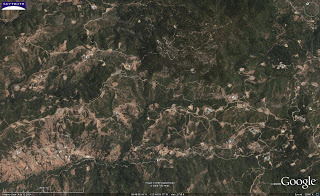 We present these images to illustrate that any big energy project has an environmental cost, and that all energy-development projects should be subject to the same level of scrutiny and public review. Maybe our top priority should be to fully exploit energy efficiency – a vast, untapped resource that yields immediate and perpetual dividends – before we rush to approve a host of industrial, utility-scale renewable projects on public lands and waters. The Cotter Corporation, a subsidiary of General Atomics, began operating a uranium mill on the outskirts of Canon City, Colorado, in 1958. Liquid wastes containing radionuclides and heavy metals were discharged from 1958 to 1978 into eleven unlined tailings ponds. The ponds were replaced in 1982 with the construction of two lined impoundments. Prior to 1982, a number of Lincoln Park wells showed elevated levels of contamination. The site was placed on the National Priorities List (NPL) of Superfund sites on September 21, 1984. In 2001, Cotter Corp. applied for a license amendment to reopen the mill. (Click here for more information). 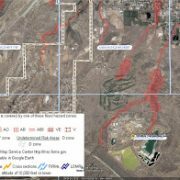 We overlaid flood data from FEMA showing areas at high risk of flooding that cross the Cotter facility and lead directly into residential neighborhoods just one mile from the site. Check out our small gallery of images. Yikes. I wonder what we’ll find tomorrow. UPDATE 4/27/09: Watch a 10-minute documentary film on the Cotter mill site and other issues surrounding uranium mining and milling (produced by Colorado Citizens Against Toxic Waste). 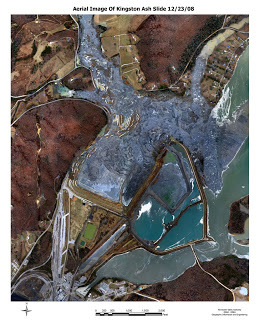 Coal combustion waste (CCW) is the fly-ash and other residue left over from burning coal. It typically contains toxic components, such as heavy metals, that are known carcinogens. CCW is disposed of in landfills, dumped (legally!) in leaky old mines and quarries, and often stored onsite in large impoundments near the coal-fired power plants. Aerial photograph of the Kingston spill taken one day after the event. See more pre- and post-spill photos. overlaying the federal government’s official “Stay-Dry” flood dataset from the Federal Emergency Management Agency (FEMA) that shows areas of high flood risk. The FEMA flood data only covered 6 of the 11 sites. FEMA notes that their digital Stay-Dry dataset is incomplete; FEMA also produces paper flood maps, but we were unable to find any online digital flood data covering these sites. 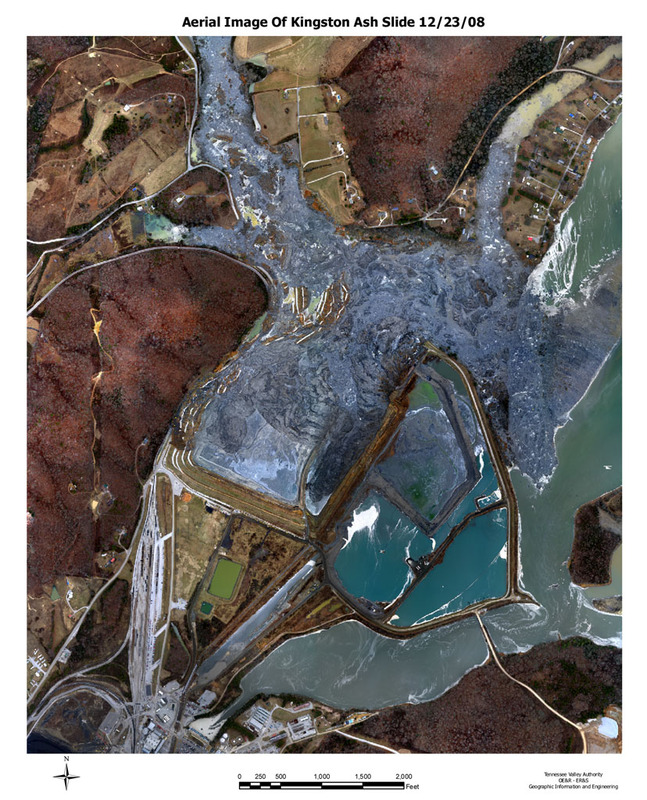 And Google Earth had old, low-resolution imagery for 4 of the sites, including Kingston, making it difficult to delineate the impoundments in those areas with high confidence (you can’t use Google for everything…yet). 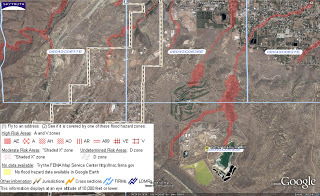 Nevertheless, out of the 4 sites for which we had both full flood data and high-resolution imagery, we found 2 clear instances (Gallatin and Widows Creek) where impoundments are located within areas mapped by FEMA as high-risk for flooding. We also identified another facility (Johnsonville) where the FEMA data are missing, but it’s reasonable to infer that the impoundments are in an area of high risk. Given the serious flooding we’ve seen lately on the Red River and some of our other midwestern rivers, not to mention the Great Flood of 1993, it seems like we’re tempting fate by storing large quantities of toxic waste in officially designated “high-risk” flood zones. UPDATE 4/3/09: Amy Mall at NRDC just let me know about yet another aspect of the CCW mess — “In Arkansas, some of this coal waste is dumped in pits used by the natural gas industry to store drilling waste, and buried. Some of these pits are on people’s property, close to their homes, and the toxic ash blows in the air…” Read her blog post to learn more. UPDATE 4/13/09: The Tennessean newspaper just published an article on this subject, referencing SkyTruth’s maps and images. Their website also includes links to other images and resources. Check it out here. UPDATE 5/11/09: Earthjustice and Environmental Integrity Project just released an analysis of a 1999 study conducted by the U.S. Environmnetal Protection Agency that found increased cancer risk for people living near CCW dumps. Apparently EPA sat on this report during the previous administration, only releasing it now under new leadership. I guess elevated cancer risk doesn’t jive very well with “clean coal” boosterism.